Death is something we all have to face, yet it is still a taboo subject for most. Talking about the end of life in a friendly, non-judgemental atmosphere may be one way of alleviating fears and concerns, and of coming to terms with it. 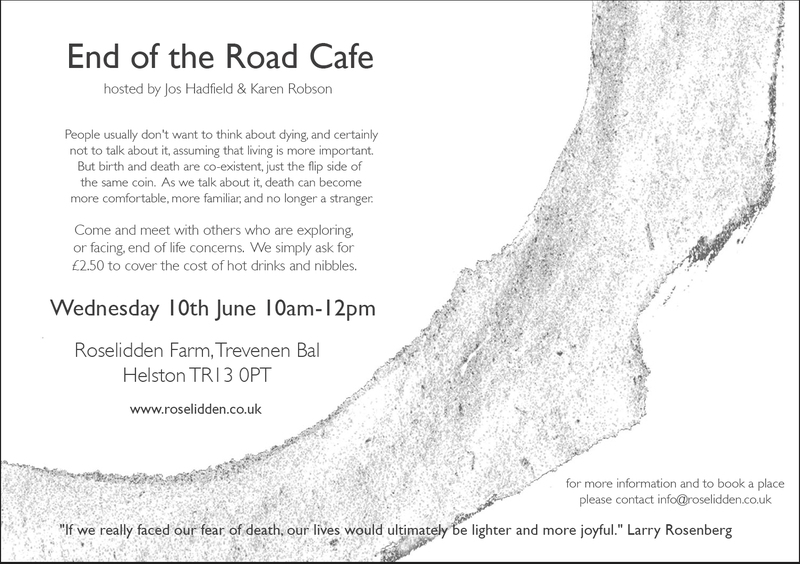 Jos Hadfield has joined the Death Café movement, and hosts the End of the Road Café, at Roselidden Farm near Helston. The Death Café movement originated in London in 2010, and has now spread across the globe. It allows for people to meet informally to talk through all aspects of the end of life. They are not so much grief or end-of-life support groups as opportunities for confidential and philosophical conversation. They are intended for people who may have someone in their family who is dying, or for people who are simply interested in exploring ideas around death and dying, knowing they too will face it one day. They offer a chance to discuss these important topics in ways that are not taboo, trivialized, or morbid. Meetings are held informally over a cup of tea, and cake, and are not for profit. For more information on the Death Café movement see Death Cafe, or visit the End of the Road Cafe Website or End of the Road Facebook Page. This first date was on Wednesday 10th June 2015 from 10 – 12noon. Further gatherings will take place on the first Wednesday of the month, as listed in the News and Diary page. £4.00 will cover the cost of a coffee/tea and cake. Numbers are limited so it is important to check first that there is space. It is hoped that the convivial environment will foster a sense of sharing thoughts and concerns about this inevitable time of our life! !